After losing their fourth straight game on October 6th, Crusader’s Head Coach, Mike O’Donnell joked with his team that the way they were playing, he was planning on booking a vacation for Mid-November, because unless something changed, he’d be available…Well, now six weeks and six wins later, that respite is going to have to wait at least another week as Archbishop Stepinac will have a state title to defend following their 29-18 come-from-behind victory over Cardinal Hayes in the NYCHSFL Triple-A league finals…The triumph on Saturday night made it four of the past five years (including back-to-back seasons) that the red, white, and blue juggernaut from White Plains finished atop the downstate Catholic landscape. 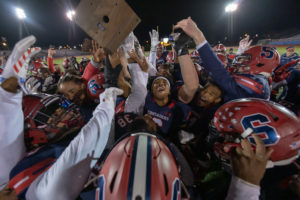 A tale of two halves, despite only trailing 12-6 at the break, Stepinac would get grossly outplayed during the opening 24 minutes, as defensive struggles on third and long situations would result in their high-powered offense possessing the ball for less than six minutes and only snapping the ball for 13 plays. Luckily for the #3 seed, one of those plays would be a 64-yard touchdown pass in the last 40 seconds of the second quarter from Joey Carino to Shawn Harris Jr. to cut a 12-0 deficit to only 12-6….This big strike came shortly after junior linebacker, Brendan Wilkins earned a sack on 4th and & goal inside his own 15 that kept the fifth-seeded Cardinals from potentially tacking on a debilitating third touchdown of the half. Hayes’ points during the opening half would come on their first two drives of the contest, when between the two possessions, they converted on 3rd and/or 4th down on six separate occasions…On their initial series, it was Jeremye Brown-Allen punching it in from the 1-yard line with 8:17 remaining in the quarter after teammates, Jalen Smith (1st down run on 3rd & 8), Tafari Mason (pass reception on 3rd &1), and Sofian Massoud (16-yard scramble on 3rd & 4) all made clutch plays. The second drive, a 17-plan, 80-yard endeavor, would conclude with the returning All-State QB, Massoud, hitting Smith on a 10-yard touchdown pass. However, it was Brown-Allen, who had 3rd & 1 and 4th &1 conversions previously, that equally shared in the credit. We weren’t privy to what O’Donnell said to his troops during halftime, but whatever it was, it certainly lit a fire under them, especially on the defense side of the gridiron…A program that is hailed for the ferocity of its pass rush, when the two teams squared off in week #8 of the regular season, the Crusaders sacked Massoud nine times…But, it was not until the start of the 3rd quarter that this vaunted front-7, consisting of 2017 NYS sack leader, Doug Simmons and nose-tackle extraordinaire, Joe Garbowski (named the Defensive Most Valuable Player of the game) turned up the heat on this chilly fall evening…Consistently applying pressure up the middle during the last two quarters of the contest, Garbowski might as well have been legally declared the Cardinals’ signal caller’s Siamese twin. Stalemated at 12-6 at around the 4:20 mark of the third stanza, Stepinac would be the beneficiaries of a very short punt that gave them the ball back on the Cardinals 27-yard line…Rolling the dice and foregoing the field goal, it would be Carino’s turn to give his foes from the Bronx a dose of their own medicine, when he scrambled on 4th &9 and hit senior WR, Nick Furio, in the back of the end zone with a 25-yard dart for the equalizer…This was the 21st overall TD hurl of the season for the Somers resident [Carino], but Furio’s first TD grab; he entered the game credited with just nine catches in 2018. Coming right back over the top to regain the lead on their next possession was CJ O’Neill’s Cardinals, who needed approximately 1:20 before Massoud played pitch-and-catch with Micheal Escobar from a distance of 15-yards away to make the score 18-12….Massoud had runs of 12 and 35 yards on consecutive plays to put his school inside the Stepinac red zone…These would be the last six points of the night that Hayes would record, as Stepinac would own the final 13+ minutes of regulation, closing the show on a 17-0 streak. At the heart of the comeback would be none other than Harris Jr…Inheriting the #6 jersey that current Syracuse student-athlete, Trill Williams, made famous last season, the 5’11, 175-pounder from Mount Vernon would make his predecessor proud, as he would catch a 56-yard pass towards the end of the 3rd quarter to move the ball to the Hayes 9-yard line and then on the first play of the 4th, he would take the jet sweep two yards to the house tie the score at 18-18…Nate Henderson’s successful PAT attempt would put Stepinac out in front for the first time all night. Never ones to quit, Hayes would mount a solid drive on their next possession, advancing the ball to the Crusader 29. However, a Smith fumble, recovered by Wilkins, would prematurely end their march. With 6:16 showing on the scoreboard, Stepinac would add a little insurance to their lead, when a 54-yard pass to an out-stretched Eugene Boyd put them in position for Henderson to kick a 25-yard field goal to make the score 22-18. Each second on the clock moving a little faster for them, Cardinal Hayes would gamble on 4th &6 with 5:20 remaining in the game, as Massoud tried to connect with Mason but the pass would be incomplete, creating a turnover on downs while on their own 47. Smelling blood and sensing that there were on the cusp of slamming the door, Malik Grant (who rushed for a NYCHSFL record 405 yards in the semifinals) would make up for what was a modest performance by his loft standards when he broke off a 22-yard run to move the ball to Hayes’s 25…Needing just one more big play to seal the victory, Stepinac would get two huge contributions out of Harris Jr. Who caught an 11-yard pass on 4th &7 with 3:23 remaining in the game and then caught a nine-yarder on an identical down for his third TD to make the score 29-18….Not surprisingly, Harris Jr. Was the unanimous choice as the Offensive MVP. With 1:40 left to play, junior defensive back, Cory Richards, ripped the ball out of the hands of Escobar to set up victory formation for the Crusaders!! !